09:55 Hello everyone and welcome to AUTOSPORT Live for continuing coverage from round 18 in this year's FIA Formula 1 world championship - the Abu Dhabi Grand Prix from the 5.554km Yas Marina circuit. 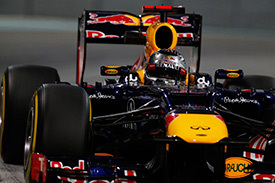 McLaren and Red Bull shared the spoils during yesterday's pair of 90-minute practice sessions. Lewis Hamilton was quickest in the afternoon, while world championship leader set the pace with a lap of 1m41.751s in the evening session. The German edged out Hamilton by 0.168s, with the pair having shared all the front row starts and wins at this gleaming venue. A big gap left Jenson Button in third, Mark Webber fourth, Romain Grosjean in fifth and his Lotus team-mate Kimi Raikkonen rounding out the top six. Fourth for Webber masked what turned out to be one of the major stories of the day. He left the pits to begin his long fuel run with water leaking from the undertray of the RB8. The run was quickly aborted and the Australian came in for a diagnosis. This was put down to a KERS-related water system - yet another problem with the Australian's power boost. Final practice begins in just under five minutes and the teams (Red Bull, more than most) have a lot of work to do in finalising the set-up for qualifying and tomorrow's race. 09:56 Weather conditions are fine and warm over Yas island today. One or two showers did briefly pop up to the south-west of Abu Dhabi on the radar, but they have since dissipated. This leaves the teams and drivers to work through their programmes in pleasant conditions, albeit with a moderate northerly breeze. Air temperature is up to today's maximum of 32 Celsius and the official sunset time is 17:41 GST (the end of Q2). 09:57 Soft and medium compound tyres proved durable during Friday's evaluation, with many outfits struggling to get the best out of the rubber until fully warmed up over a series of laps. "There is between 0.4s to 0.8s difference in performance between the soft and the medium tyres here," concludes Pirelli's Paul Hembery. "Durability is very good on both compounds, with low degradation, and, just as was the case last year, we can all easily see how all the teams have understood how to get the very most out of our tyres as their knowledge and data bank has increased towards the end of the season. "As a result, we may even see some drivers trying one pit stop here during the race whereas last year two stops was Hamilton's winning strategy," said Hembery. 09:57 Track temperature has climbed to a sizzling 47 degrees, with a few minutes to go until the start of the session. 09:58 Ferrari again broke the curfew overnight, with the team pushing to bring single-lap pace to Alonso's title challenge ahead of qualifying. 09:59 Webber is already strapped into the car and ready to go out when the track opens. He has a lot of work to do, after a KERS issue yesterday. 09:59 Long run pace was closely matched between Red Bull and its rivals yesterday, with both Button and Massa setting impressive long run times. 10:00 The Australian was unable to work through a long run towards the end of second practice, leaving Vettel to gather most of the Sunday data. 0 min: Several drivers are straight out onto the circuit. Karthikeyan, Vergne, di Resta, Ricciardo, Maldonado and Senna among them. 1 min: Drivers pile out of the pits to put a checking lap on the re-assembled cars, which have now been fitted with race engines and gearboxes. 1 min: Widespread installation laps now taking place, as Senna, Webber, Schumacher, Vettel and de la Rosa head out. 2 min: Ferrari's efforts continue with flow-vis paint being applied to the intricate new front wing on Alonso's car. 2 min: The early runners are already back into the pitlane at the completion of one lap. 3 min: Hulkenberg and Rosberg are among the last to join the circuit this afternoon. 3 min: Hamilton, who looked on his usual fine form at this venue yesterday, heads out for a first lap in his McLaren. 3 min: Di Resta continues on into a second tour of the circuit. The Scot has a changed chassis for this weekend, after problems in recent events. 4 min: Webber and Schumacher have also crossed the line and started a second lap of the 5.554km circuit. 5 min: The pair return to the pits in close formation, completing a brace of laps for the installation run. 8 min: Hulkenberg's car is placed onto a trolley and he is pushed into the garage, rather than being wheeled back as is standard. 8 min: Kobayashi ends a brief period of silence and heads out for a run in the Sauber. 9 min: Schumacher climbs out of his car, while routine checks are carried out following his installation run. 10 min: Telemetry data analysis now taking place in the garages. Once the software boffins are satisfied that all is okay, they will signal to each race engineer that they can continue with today's planned programme. 10 min: Kobayashi crosses the start-finish line and begins what may be the first timed lap of the day. 11 min: Karthikeyan and Pic join the racetrack to begin a run of laps. 12 min: Glock joins them in the other Marussia entry. 12 min: Kobayashi sets things going with a sedate 1m49.193s lap. 14 min: The tyre covers are taken off Senna's car and he is joining the track with the medium compound on. 14 min: A 1m45.628s is a big improvement from Kobayashi as he significantly improves the benchmark time. 15 min: Maldonado similarly heads out for a run with the harder of the two tyre compounds bolted onto the Williams. 15 min: Karthikeyan is the second man to post a time with 1m49.121s. 15 min: Vettel remains in the car, as routine work is finished in preparation for a run on the circuit. 16 min: Glock slots in second fastest in the early times, with Pic currently fourth. 16 min: Ricciardo and de la Rosa join the track for their first meaningful run of the day. 16 min: Perez slots in second fastest to his team-mate with an inital 1m46.178s lap. 17 min: Raikkonen is next to top the order with a 1m44.654s lap in his Lotus. 17 min: Ricciardo completes his first timed lap and moves into fourth spot with a time of 1m46.215s. 18 min: Senna is on the board in ninth place with 1m49.800s after his first timed lap. 19 min: Grosjean recovers from an earlier moment to go second fastest in 1m44.829s. 19 min: Maldonado gets brave with the traffic on his way to fifth place and a time of 1m45.762s. 19 min: Sauber drivers trade fastest sectors, with Kobayashi now third and Perez fourth. 19 min: The Venezuelan almost barged Charles Pic out of the way through the final section, but the pair were able to avoid contact. 20 min: Rosberg heads out to begin a run with the harder tyre bolted on. 20 min: Perez clocks a 1m44.821s to go second fastest as the early runs continue on hard tyres. 20 min: Raikkonen heads the pack with 1m44.654s for now, with Perez second, Grosjean third, Kobayashi fourth and Maldonado in fifth spot. 21 min: Schumacher and Hulkenberg are also on track to begin their first proper run of the day. 21 min: Hamilton is on his opening flying effort and is the fastest man in the middle part of the lap. 21 min: Senna moves into fourth spot with a time of 1m44.934s. 22 min: A good final sector from Hamilton, where he is particularly strong here, puts the McLaren on top in 1m44.264s. 22 min: Schumacher's opening effort is a building lap of 2m01.949s as he works through checks for the team. 23 min: Maldonado noisily blasts round and takes over at the top with 1m43.979s. 23 min: Alonso is finally readying himself for a run in the upgraded Ferrari. 24 min: Vergne moves up a place to seventh with 1m45.065s. 24 min: Massa springs up to fourth fastest with a 1m44.370s lap. 25 min: Hamilton is on a quick one now, topping the first two sectors. 25 min: Vettel and Webber are now on the track for Red Bull. 26 min: Hamilton puts himself back on top with a rapid 1m42.851s, over a second quicker than Maldonado's previous marker. 26 min: Schumacher has moved up to third spot, behind Hamilton and Maldonado, with a time of 1m44.128s in the Mercedes. 26 min: Hulkenberg completes an improving lap and moves up to seventh with 1m44.362s. 27 min: Maldonado is back into the pits after a six lap run in the Williams. He is wheeled back into the garage. 27 min: Hamilton is told of his session-topping achievements as he pits the McLaren to wrap up a productive first run. 27 min: Vettel is back in after a single lap, rather than work through a run. 28 min: Webber remains on track and is into his first timed lap of the day. 28 min: Button and Alonso are yet to post times but are heading around to begin attempts against the clock. 28 min: Hulkenberg has moved up again to third spot after a lap of 1m44.117s. 29 min: Webber comes round to complete that first effort and he goes fifth with 1m44.214s. 30 min: Rosberg moves up the order to 10th spot with a lap of 1m44.409s in the Mercedes. 30 min: Hamilton is quickly back out and on it again with another best in the first part of the lap. 31 min: Webber continues on for another lap and moves into second spot behind Hamilton, with a time of 1m43.849s. 31 min: Alonso joins the order in eighth fastest. 31 min: Hamilton further extends the benchmark with an all-purple lap of 1m42.481s. 32 min: Still no move from Vettel after what was clearly an aborted run a few minutes ago. He remains in the garage. 32 min: Button is 13th after his opening attempt on the harder tyres. 33 min: Only 27 minutes of the session remaining and Hamilton tops the order ahead of Webber, Maldonado, Hulkenberg and Schumacher in fifth. 33 min: Rosberg continued to climb up the list and he is now sixth, with di Resta seventh and Raikkonen in eighth spot. 34 min: Hulkenberg is still out there and he moves up to second spot, with a time of 1m43.786s. 35 min: Raikkonen improves his best for seventh fastest as Alonso moves his Ferrari up to third. 35 min: Vettel remains in the Red Bull garage while the mechanics bleed the brakes. Under 25 minutes to go. 35 min: Hamilton pushes on, finding even more speed for a 1m42.148s - almost 1.5s quicker than Webber's Red Bull. 37 min: Senna is the first man to try out the soft compound tyres. 37 min: Button finally makes it a McLaren one-two as he clocks a 1m42.879s, the first man to get within a second of Hamilton's quick times. 37 min: While the brakes are tended to, Vettel has elected to remain in the car so that he loses the least amount of time. 38 min: Grosjean is the next to switch to soft rubber. 38 min: Senna's best time so far in the session is 1m44.349s on the medium compound. 39 min: Alonso improves to take back third fastest from Webber but is still well over a second off Hamilton's benchmark. 39 min: Webber is on a much better lap now and set to improve. He crosses the line and moves into third spot with 1m43.414s. 41 min: Button clocks a 1m42.496s, moving to within 0.348s of Hamilton on the harder tyres. 41 min: This is clearly a bigger job than merely bleeding the brakes. Both front units are completely off the car and this is becoming a major job. 41 min: Meanwhile, Grosjean finds speed in the soft tyres to go third fastest with a 1m43.261s lap. 42 min: Vettel remains in the car while all this work is going on. 42 min: Meanwhile, we are also tracking Senna and he has improved by three-tenths of a second on softs with a lap of 1m44.071s. He is up to 10th. 44 min: Schumacher takes that 10th position with a time of 1m44.037s, as Senna cools his soft tyres down and then pits. 45 min: Button pits to wrap up his efforts on the harder tyres, with McLaren looking strong on the medium compound during these hot conditions. 46 min: Under 14 minutes remaining and Vettel's front brakes are almost back together again. He could be out in as little as five minutes from now. 47 min: It is clearly turning into a difficult weekend for Red Bull. Each car has lost a lot of time at two critical stages of the weekend programme. 48 min: Soft tyres being readied throughout the garages, with teams preparing for a qualifying simulation, although it will be much cooler later on. 49 min: Little else going on apart from the race against time down at the champion garage. Hamilton remains on top with 1m42.148s. 49 min: Button is second with Grosjean third, Maldonado fourth, Webber fifth, Alonso sixth and Hulkenberg in seventh spot. 50 min: Hulkenberg breaks the silence towards the end of the session and heads out for a run in the Force India. 50 min: Kovalainen heads out to make his attempt on the soft rubber. 51 min: Alonso heads out for his run on softs. 51 min: Soft tyres for Hulkenberg and this will give him a few laps to get a heat cycle completed and a couple of fast attempts in. 52 min: Maldonado, Webber, di Resta and Karthikeyan head out, as Hulkenberg begins a timed lap. 54 min: Vettel remains in the car and now the rear brakes are being tended to. 54 min: Getting busy out there now as drivers begin flying laps with the softs. Many will plan a run of several laps to see if more pace appears. 54 min: Everyone is on track with the exception of Vergne and Vettel. Hulkenberg moves up to seventh with 1m43.786s. 55 min: Webber is flying and it's all happening at Yas Marina. The Australian moves up to third with 1m42.743s on soft tyres. 55 min: Alonso finds only marginal improvement with his first soft tyre lap, remaining 1.3s off Hamilton's medium compound best. 55 min: Oh and here we go. Vettel is rolling down the pitlane and straight out onto the soft tyre. 56 min: Raikkonen goes fifth fastest with an improvement on softs. 56 min: Hamilton locks up at his first try on soft rubber at the tricky Turn 5 chicane. 56 min: Under five minutes remaining and the German has a challenge on his hands now. First check will be to make sure he is happy with the brakes. 57 min: Hulkenberg has continued with the gradual improvements. He is now into fifth with a lap of 1m43.091s. 57 min: Button clocks an improvement to 1m42.420s but remains second to Hamilton's earlier best. 57 min: Vettel crosses the line and begins a timed lap. 57 min: Hamilton has reset and is now the fastest man in the first two sectors. 58 min: Traffic for Hamilton in the final sector but it is a marginal improvement to 1m42.130s. 58 min: Vettel is three-tenths off Hamilton's new benchmark time in the first sector of the lap. 59 min: Vettel is up to speed, but he backs off in traffic in the middle of his first attempt. 59 min: Alonso improves his best but it is only enough for seventh fastest, a second slower than Hamilton. 59 min: So this will be a slow time. Vettel comes through in 1m50.806s and will go again. 60 min: The flag is out on final practice at Yas Marina. 11:00 Vergne has improved with a lap of 1m44.025s. He is 15th in the classification. 11:00 Vettel finds another tenth in the first sector compared with his aborted lap. 11:01 With the flag out this is going to be his one and only effort on the board. 11:01 Vettel rounds the final corner and goes third with a time of 1m42.614s. 11:02 Adrian Newey shakes his head after a difficult session. Vettel is 0.484s off the pace after that lap. 11:03 Lewis Hamilton tops final practice at Yas Marina with a time of 1m42.130s, 0.290s clear of team-mate Jenson Button. 11:03 Vettel as we have mentioned is third. After all that he is still more than one-tenth clear of team-mate Webber, with Hulkenberg fifth. 11:04 Grosjean is sixth in the leading Lotus, ahead of Maldonado in seventh and Alonso down in eighth, 1.003s off the leading pace. 11:05 Raikkonen ends the session in ninth and di Resta makes good after losing track time yesterday. He rounds out the top 10. 11:06 One of the most interesting final practice sessions of the year and Red Bull having issues. Join us later for qualifying from Abu Dhabi.